Explanation: Have you seen a panorama from another world lately? Assembled from high-resolution scans of the original film frames, this one sweeps across the magnificent desolation of the Apollo 11 landing site on the Moon's Sea of Tranquility. 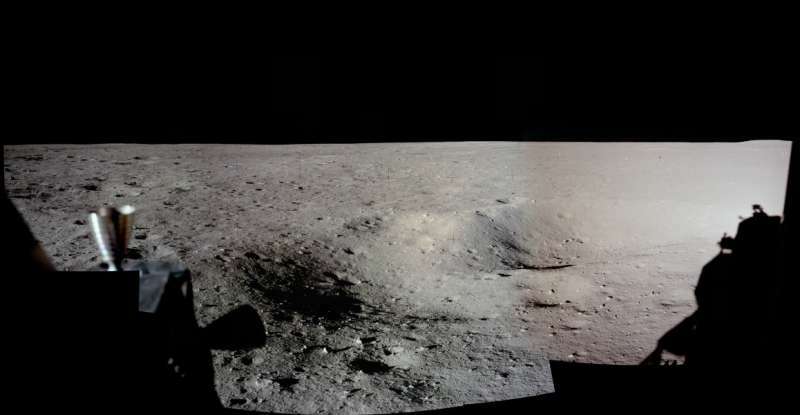 Taken by Neil Armstrong looking out his window of the Eagle Lunar Module, the frame at the far left (AS11-37-5449) is the first picture taken by a person on another world. Toward the south, thruster nozzles can be seen in the foreground on the left, while at the right, the shadow of the Eagle is visible toward the west. For scale, the large, shallow crater on the right has a diameter of about 12 meters. Frames taken from the Lunar Module windows about an hour and a half after landing, before walking on the lunar surface, were intended to initially document the landing site in case an early departure was necessary.